Joomla! 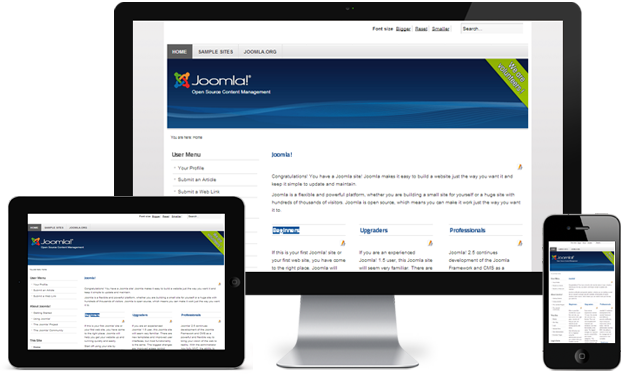 Templates offered here at Joomla Design are designed especially for use with the Joomla! CMS system. Professional and reliable super fast Joomla! Hosting! for the Joomla! content management system (CMS). Free Site Migration, Free Joomla! Setup, Unlimited Storage, Unlimited Site Traffic, Unlimited MySQL data base, Daily Offsite Backups, 99.9% Uptime Guarantee. Joomla! hosting that grows with your business. Joomla Design UK based in London England UK offers great design and template solutions for Joomla!® award-winning Open source content management system (CMS). The professionally designed and high quality mobile friendly templates at Joomla Design can offer you competitive prices than other larger web design companies and web design agencies, take a look at our joomla templates here.. Being based in UK Joomladesign.co.uk can offer great email and phone support 24/7, not like other web design agencies. Looking to outsource Joomla! or would like to find out more about the Joomla! CMS system why not give us a call or contact us here. Our Joomla! Design Services for the Joomla! Content Management System. Joomla Design offers custom design services in various areas of Joomla! web development. We code Joomla! with web standards in mind and tested in multiple browsers, among them are Internet Explorer, Firefox, Opera, Google Chrome, Safari and more. Joomla! Templates are designed especially for use with the Joomla! CMS system. They are all professionally designed for high quality in function and in looks. The Joomla! Templates are suitable both for personal and corporate Joomla! sites more..
Joomla Design specialize in providing reliable, affordable Joomla! web hosting solutions. Our Joomla! UK hosting packages include everything you need including speed, reliability, unbeatable diskspace, Unlimited Autoresponders, Unlimited Mailing Lists and 24/7 UK support more.. Copyright © 2005 - 2019 Joomla Design All rights reserved. JoomlaDesign.co.uk (Joomla Design) is not affiliated with or endorsed by The Joomla! Project™ or Open Source Matters (OSM). The Joomla!® name and logo is used under a limited license granted by Open Source Matters Inc. the trademark holder in the United States and other countries.